We believe you can never get enough of a good thing so instead of one exciting run through this beautiful canyon (our regular 1-Day trip), on our Goodwin Canyon Double Days trip we do two satisfying runs, plus a BBQ lunch in between! After meeting near the quaint, historic town of Knights Ferry, we take a short shuttle to the starting point for the run. Under towering cottonwood trees and impressive cliffs rising from the water's edge, we take several minutes for instruction while marveling at the unusual and captivating scenery of this special canyon: lava boulders, giant fig trees, river willows, wild grape, and alders, which provide a dramatic framework for this short and wild ride through Goodwin Canyon, one of the best early spring and fall Class IV+ runs in California. As with any trip on Goodwin, it starts off fast and furious...two exciting Class III rapids a few seconds from put-in and a mandatory scout of Mr. Toad's Wild Ride before plunging down this impressive drop which leaves guest and guide with an overdose of adrenaline in the deep clear pool below! Once we catch our breath again we experience several narrow, fun shoots through willows and sculpted boulders that lead to a surprising eight-foot vertical waterfall called Matterhorn that requires a short, fast portage. More fun twists and turns through Upper Pinball and Lower Pinball Rapids lead abruptly to the always intimidating Haunted House Rapid that drops seven feet into a truck-size boulder! If all this sounds too exciting, take heart, there are soothing calms spread throughout the run that allow you to relax and enjoy the fantastic scenery around you and above you. Once we get back to Knights Ferry where our trip began, we float under the longest covered bridge west of the Mississippi, before enjoying a BBQ lunch on dry land. When finished we head back up to complete our Goodwin Canyon Double Days for another run before getting back to Knights Ferry again, satisfied and full of a good thing. 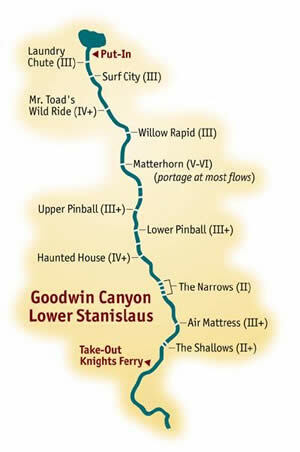 For those who do not wish to partake in the second run after the BBQ, there is an option to enjoy the Stanislaus River Park Museum and the small, historic town of Knights Ferry. Both are within short walking distance from the river. "Thanks for the fun day out. We had a great time. The double-run is unique in its own way and even if you do all the rapids twice there is lot of excitement. "